We all know that taxes on alcohol and tobacco are pretty high in the UK - and a lot higher than in some countries in Europe like France and Belgium. Taking a day trip to one of these countries to stock up on wine, beer or cigarettes is a popular way around these high prices - and can really save you money if you buy enough. If you're planning a trip like this - especially for more than one person - you will probably find that you car is nowhere near big enough for all that you are planning to buy. The solution to this is to rent a van - it need only be for one day and will work out very cheap if two or more of you club together. How much alcohol and tobacco can you bring back from the EU? How much does it all weigh - liquid is heavy! Can I Take My Hire Van To Europe? Since the abolition of duty-free, you are legally allowed to bring back as much alcohol and tobacco as you like from most countries in the EU, as long as it is for personal consumption (or gifts). However, it's not quite as simple as that. Since this lack of restrictions presents great opportunities for smugglers and unlicensed sellers, UK customs are always on the lookout for anyone who looks like they might be planning to sell their load of drink or tobacco. This is more likely to apply to people using vans, due to their larger load capacity. These aren't hard and fast rules, but expect to be asked to explain yourself if you are bringing more than this back for personal use. Although it's not something we normally think about when buying groceries, a large amount of wine or beer can weigh a significant amount. 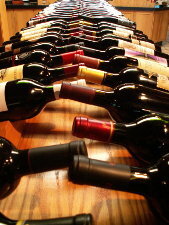 For example, the 90 litres of wine mentioned above would typically weigh around 150kg (around 1.2kg per bottle). Champagne/sparkling wines weigh more, as they have much thicker, heavier bottles. You are overloaded, and breaking the law. It's surprisingly easy to overload a van. Even though the van will probably still drive okay, you will be breaking the law and if involved in an accident could find that your insurance (or that of your van hire company) is invalidated. You could also be pulled over by DVSA for a routine check and be fined and required to remove the excess load before you are allowed to continue. It's always worth doing the calculations before you go - make sure that you know the payload of your rental van. Always remember to include the weight of the driver and passengers! Remember, if you're hiring a van in the UK to drive to France or any other European country, you will need a Vehicle On Hire Certificate (VE103). Ensure your van hire company allows travel into Europe with their hire vans and provides all the neccessary documents for European travel.